Next week I am giving a session on Managing Multiple Projects. Tracking is a major part, so I have been researching this topic. As well, as these things go, I have had a few conversations with project managers on the topic of “nagging” (ahem... “tracking”). Do project managers like to nag? Of course not. Do they? Very often. The researchers shadowed these managers at meetings, followed them around the office as they dropped in on subordinates, and sat for hours at their desks looking over their shoulders, recording their phone calls and e-mails. (Hey, talk about nagging!) They ultimately collected 256 hours’ worth of observations. Their findings, published recently in the journal Organization Science, show that in a typical 4½-hour stretch, 14% of all communication was redundant. In other words, managers spent a fair chunk of time following up with employees to reiterate information they had already explained. Frequency mattered more in convincing employees to get working, and managers who were deliberately repetitive from the start tended to move their projects along faster and received less resistance from their teams. This all makes sense to me and agrees with the concept of weekly team meetings - of which I am a big fan - and daily contact, if possible, either through meetings or walk-abouts. After all, the project manager’s job is to manage. Helping the team get there is a huge part of that. Of course, other project management practices, such as having team members define their work and provide estimates, creating a Communications Plan that identifies when, how and what to communicate with stakeholders (including team members), and creating a Roles and Responsibility matrix, also help with reducing the need to nag. Well, I said, "Do you have goals that you work toward with deadlines?" Of course they do. That was really the basis of their projects. One colleague is in the real estate industry. Every house for sale is a project. The other is an account manager. Each account has several projects. It was interesting to talk about how project management principles apply across industries - and no matter the size of the business. Because I am a business owner myself, I knew my friends deal with budgets and schedules. They certainly consider risks. And communications is a huge part of their projects. Procurement also figured in there, as did staffing. Another thing we discussed was our businesses’ visions and strategies. This reminded me of how projects should fit in with the organization’s vision and strategy, no matter the size of the business. I know that a few times I've gone off course from my selected vision and strategy - not a recommended practice. So, are small business owners also project managers? Of course! It’s practically a way of life. Do you manage projects, large or small? 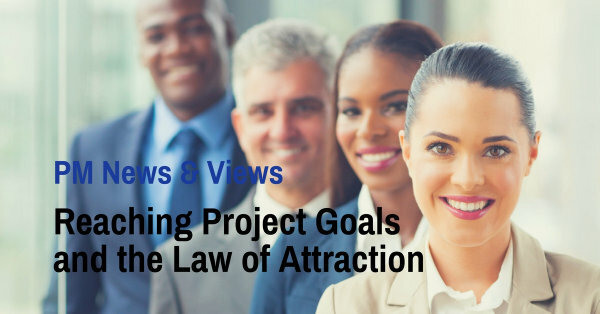 If so, have you thought about how completing a project successfully and using the Law of Attraction are alike? Being interested in both topics, I have thought about this interaction quite a bit. And here is my view. According to the Project Management Institute (PMI), a project is “a temporary endeavour undertaken to create a unique product, service or result.” So, our goal in a project is to create a particular product, service or result. How do we perform this creation? One of the main things we will do is to build a picture/description of the outcome, and get agreement on it. For example, if our project is to create a website for our company, we define the overall look of the website, how many pages the site is to include, and the site’s purpose before we get down to work. Thus, we are defining the scope of the project. When we do this, we almost always visualize the end-result and work from there. So, how is this similar to getting what you want through the Law of Attraction? The Law of Attraction is based on the premise that if we can see and believe what we want, we will attain it. So, like in a project, we are seeing and focusing on what we want. In a project, this focus and belief in the end-goal provides not only a focal point for project team members, but also gives motivation – the team working towards a goal. If you have worked on a project where all team members had the goal in mind, you will know the feeling of synergy and excitement that can result from this “beginning with the end in mind” as Steven Covey says. Why not try it, if you have not already, in your work and personal life? Imagine the desired results (outcome) to get results! As you do so, ideas on how these results may come about might spring to your mind, or maybe you will find yourself doing things that help bring about the outcome. Whichever way it happens for you, please email me with your results, I would love to hear your stories. In this day and age many businesses are working on incorporating online tools into their product portfolio. If you are, you might want to consider planning before you begin your exciting new project. Begin with the end in mind. Stephen Covey’s maxim holds true for any project. Before you can start any venture or project, you must know what you want! Gather a support team. It is hard to work by yourself. In fact, we cannot achieve many goals without the involvement of other people. Build in support for yourself and your project. Think about whose help you will need in achieving your aims, and get in touch with them. It might take a few conversations to get the ball rolling, but you will eventually find it much easier to achieve your project goals with the right team in place. Identify everything you need to do to achieve your goal. You will want the help of your team to do this. 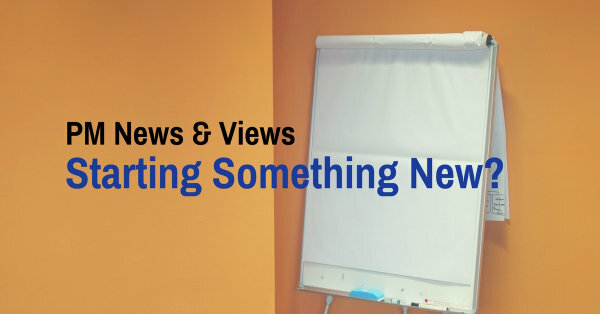 Maybe you will have a brainstorming meeting where everyone feels welcome to shout out their ideas about the tasks required. Once you have identified what needs to be done, you can put the tasks in order and figure out how long each will take and who will do them. Document! Don’t forget to put your plan in writing. This will make tracking and keeping control much easier. As well, any decisions about your project, such as what tools you will use or who does what, should be documented. Last week was a busy one for me. Programs to design, questions to answer, and preparing for a project that I just couldn't get my mind around. It was too big. There were too many risks. I didn't want to face it. So, there I was, ignoring what I have to do and feeling the subconscious strain from that. I pride myself on not being a worrier but I think this ignoring strategy got the better of me. I got a head cold - a great excuse not to use my brain. And then it dawned on me. 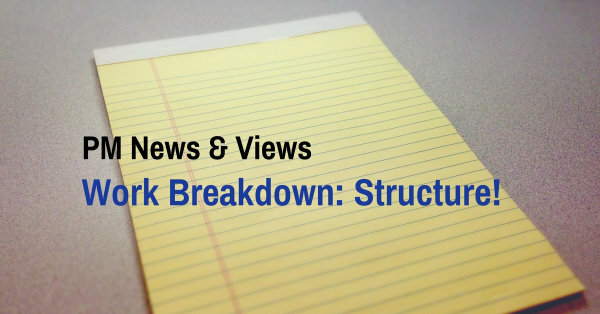 I was not using the Work Breakdown Structure (WBS)... and my structure was breaking down. The overload on the brain of looking at the work in one big chunk was terrifying me. It was overwhelming. I broke down the areas of the project and it was amazingly simple. As soon as I saw the work and what had to be done - and figured out the time - I breathed a sigh of relief. This was going to be easy. Even though I teach and preach about WBS’s all the time, I sometimes lose sight of the basics. They work!